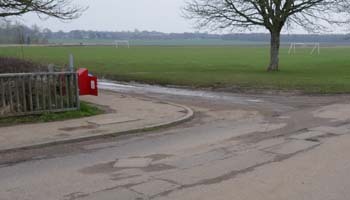 The club is in the grounds of Wrest Park, to the east of Silsoe village. The postcode for Wrest Park is MK45 4HR. Silsoe is on the original A6 just south of Clophill, halfway between Bedford and Luton. The A6 now bypasses the village and runs under the drive leading to Wrest Park. For a Street Map, click here. 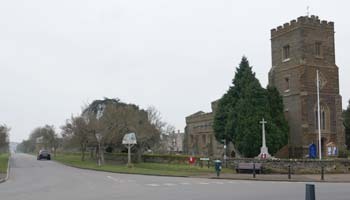 From A6 driving north: Leave the A6 at the roundabout and head into Silsoe. From A6 driving south: After the roundabout at Clophill you will see a brown English Heritage sign for Wrest Park pointing straight on. Ignore this and follow the sign for Silsoe - you must move into the right-hand lane as you crest the hill in order to turn right across the dual carriageway. The entrance to Wrest Park is immediately north of the church. Follow the drive through the entrance gateway and across the bridge over the A6. I mmediately after crossing the bridge, turn left onto the track. Park next to the pavilion. If English Heritage are staging a major event and the playing field is roped off, use the public car parking area as directed by the stewards. Take great care when leaving, as the view when turning right from the track onto the drive is restricted. If you want to visit the club as a prospective member then contact the Secretary - see the Contacts page. If you just want to see croquet being played then come on a weekend when a tournament is taking place. The dates can be found on the Diary page. 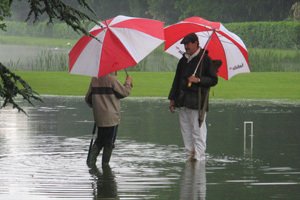 Rain does not stop play unless there is standing water on the lawns.